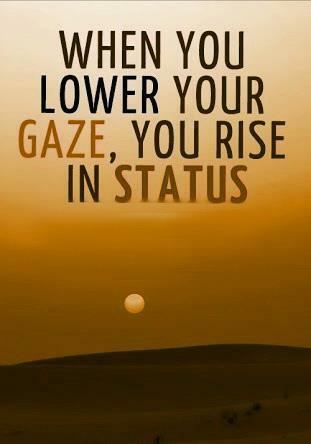 One of the highest forms of modesty is the lowering of one’s gaze. The Holy Last Messenger (peace and blessings be upon him) said, “And the eyes commit zinna, their zinna is gazing”. Hazrat Imam Ali, Allah’s blessing be upon him, has also stated, “The eye is the spy of the hearts and the messenger of the intellect, therefore lower your gaze from whatever is not appropriate to your faith.” Casting our glance towards things that are inappropriate to our sight can hurt us outwardly and inwardly, and cause spiritual sickness. It is not only for us to guard what our children are exposed to, but also guard what we expose ourselves to as well. It is our duty to lower our gaze, and draw our eyes away from that which is inappropriate. The Holy Last Messenger (peace and blessings be upon him) said, “Haya (modesty) is a part of iman (faith). The philosophy behind what is commonly called hijab is rooted in the concept of guarding the senses from anything that may lessen one’s innocence. The most visible form of hijab is the headscarf, however, it is beyond that. It is a barrier and a partition. It is the principle of modesty and includes behavior as well as dress, for both males and females. In the English speaking world, hijab is limited to the covering of the head, which is more accurately called khimar, a head covering for females. Purdah, the physical separation (with curtain, partition, wall, distance, etc) of unrelated men and women from social intermingling, as well as hijab, plays a huge role in modesty. Why should one display one’s beauty for unwanted eyes to feast upon, and possibly be moved to commit sin -outwardly or inwardly? Hijab and purdah protect a woman’s honor [and society], and since it is a command from the Almighty, it is He that is giving the lady that honor. Muslim women are required to observe hijab in front of any male they can lawfully marry. This means hijab is not obligatory in front of the father, grandfather, uncle, brother, nephew, and young children; but the fact that you do not have to observe hijab in front of those previously named does not mean you do not have to adopt a code of modesty in front of them. Our modesty is a trust from Allah, therefore, it is of the utmost importance that we safeguard it – no matter what. Because of the beauty of the Messenger Yusuf (Joseph), peace be upon him, Satan tried to attack him from every angle. But there was no way to penetrate his modesty. When Zulaikha called him into the room, he said, “I cannot do this, for I am ashamed in front of my Lord to commit such an act”. A strong believer feels shyness in front of Allah, God Almighty, and His creation. Since Allah, exalted is He, is the Seer and Knower of all, he feels shy to disobey his Lord, and feels ashamed to act inappropriately, whether in public or private. This type of modesty is acquired and is directly related to one’s faith, where one’s awareness of [the presence of Allah] increases one’s shyness in front of Him. One should keep in mind that you are never alone, and should remain modest at all times, as not to offend those inhabitants of the unseen world, and give Allah displeasure. Modesty is also a quality that distinguishes humans from animals. Animals follow instinct without feeling any shyness or any sense of wrong or right. It is human nature to cover one’s self. When our father Adam and mother Hawwa (Eve) ate from the forbidden tree, they realized their bodies were exposed; filled with shame and shyness, they covered themselves. Modesty is a sense of shame or shyness in human beings. It is a guard against foul conduct – a quality that prevents one from behaving badly towards others, and others from behaving badly towards them. Modesty is more than the way one dresses. It reflects in a person’s speech and actions. Therefore, it must begin with the heart. The Holy Last Messenger, peace and blessings be upon him, stated: “Modesty is part of the faith, and that part of faith must lie in the heart”. To cast a glance is human, but to control one’s gaze is Mumin (the sign of a believer). Indeed, Allah is Most Wise in the laws He laid down for us regarding modesty, lowering one’s gaze, and not being alone with a non-mahram (one you can marry). Islam does not forbid men and women to interact; however, it enjoins them to adopt a code of conduct towards each other characterized by modesty, so that they may treat each other with respect. Islam, when it declared some harmful acts as forbidden, it also imposed restrictions on the overtures leading to them. In the present case the real objective is to prevent indecency amongst men and women. After stating the commandment to lower their gazes, given to first men, then women; women are next required to cover their bodies from head to feet. not been held as proper in good families universally.